I love Dial Body Wash and Hand Soap! There are so many great scents available and I like the way the soap suds up. Having a nice sudsy soap is very important in my book. 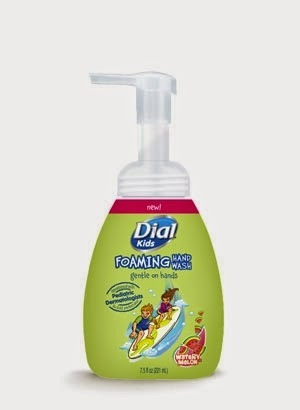 When I heard that Dial had kid's products available I wanted to try them for myself. I was sent a sample of Dial Baby Body & Hair Wash and Dial Kids Foaming Hand Wash to facilitate this review, all opinions are mine and no further compensation was provided. Both the Dial Baby Body & Hair Wash and Dial Kids Foaming Hand Wash were developed with pediatric dermatologists. The formulas are designed to be gentle on babies skin yet tough enough to get your baby or child squeaky clean. My kids love foaming hand soap! My younger daughter likes it a little too much and will wash her hands over and over again since she likes the feel of the foaming soap. For this reason, I put the Dial Kids Foaming Hand Wash in the kitchen. The hand wash smells like watermelon which most kids will like and it lathers up really well. 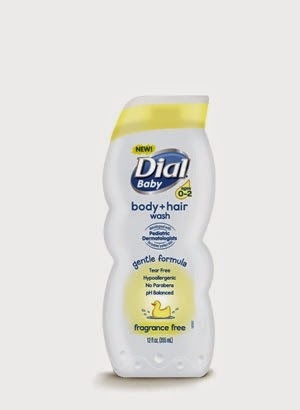 The Dial Baby Body & Hair Wash is designed for babies ages 0-2. My kids are all older than that so I assumed I wouldn't like the product as a shampoo. As far as body washes go it's a great product. My kids didn't like that it was fragrance free but that's OK. I did use it once as a shampoo just to see how it would clean. I had no problem with my son's hair but it wasn't good for my daughter's long, thick hair. Now I'm just using it as a body wash.
Three lucky readers will win a coupon to try one of these products. Enter on the Rafflecopter form. Learn more about these products by visiting Dial's website.